There's nothing like forcing yourself to play a game you hate. Now we all know there are several ways to do this. You can force yourself out of sheer OCD or masochistic tendencies. You can lose a bet. You can be left in an empty room with nothing but the dreaded game to play. Or you can enter a competition where your peers genuinely love the game you hate. This last option is an interesting one, and by now I believe it's the best way to really wade through a game you despise. You might see beyond what frustrates you so much and even come to enjoy it for what it is. Every game has a comfort zone where its reason to exist starts showing itself, and during these last weeks I was able to reach such zone in Sol Divide, one of my early disappointments with the gaming genre I love the most. Right after my gaming habits shifted completely to shmups, Sol Divide for the Playstation fell on my lap. For whatever reason I gave it a chance, and the experience left me nearly traumatized. It was definitely one of the worst shmups I had ever played, and for me it was hard to contain the disappointment when talking or writing about the game. I saw it as a failed experiment in merging a shmup with a beat'em up, a foray into unknown territory that was nearly unplayable for a newbie such as myself. Seriously, this game haunted me in my dreams. Today I am aware that Sol Divide requires a very specific mindset to be played. Don't think that shooting will take you where you want to go - this was my main mistake back then. And bear in mind this is a Psikyo game. Though not quite visible to the eye, the company's trademarks are buried deep within, and being familiar with Psikyo in general definitely helps to break the ice here. Graphics and sounds are probably the best features Sol Divide has going for it. Characters and bosses are very nicely animated, and the music suits the atmosphere really well. Backgrounds are rich and colorful, even if they don't scroll even one entire screen per stage (by the way, stages in this game are some of the shortest ever designed in any shmup). The rule of thumb is that you must go through just a few enemy waves and then fight the boss. The medieval setting involves a wizard doing all sorts of evil deeds, which prompts the three selectable heroes to fight his army of undead and mythical creatures (the starting stage changes depending on the character you choose). It does resemble an RPG, but the game is actually quite relentless in its awkward pacing and overwhelming challenge. If you're used to only holding the fire button from start to finish in a shmup, be prepared for a whole new experience when trying Sol Divide. Tyora: slash, slash, slash, ↓, slash. While Vorg and Tyora have stronger combinations for shot + magic, in my opinion Kashon is the best character not only because his combo feels more natural, but also because he's got the best reach. Performing these combos is also of great importance for scoring, since killing an enemy in the last slash adds a ×4 multiplier to the enemy's base value. Holding slash with diagonals results in different attacks that are powerful but add nothing extra to the score. Mastering the use of magic spells is another important part of gameplay, but it becomes less critical as you start to get familiar with enemy attack patterns and their related timing. In my final strategy I only used "phoenix" in the stone griffon, "freeze" in the dinosaur form of the last boss and "fire" extensively in several parts of the game. The magic stock is represented by the meter right below the character's health bar and is slowly filled by killing enemies with the slash attack, but it does fill faster when you take potions left by defeated enemies. Not all spells are useful for every situation, and a few of them can only be used once, so knowing when to use them is essential to make progress in the game. XS Games ported Sol Divide to the PS1 in the west very late in the console's life, complete with its well known poor quality standards on localizations. Even though the gameplay is intact, the port is aesthetically butchered because it lacks all the brief dialogue that should be displayed whenever a stage starts, while the few remaining texts shown in the ending screens were not translated at all. There is an Arrange mode that focuses on the RPG elements and supposedly increases the game length considerably, but with the lack of any saving functionality you won't be able to preserve stats and checkpoints. I didn't even bother to check this mode. Going to the options screen allows you to activate the display of in-stage score, which also enables you to see the multipliers you get from slash combos. 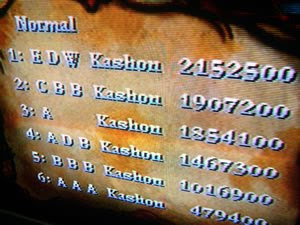 My time with the game resulted in the high score below, reaching stage 2-2 with Kashon on difficulty 5 (NORMAL). During Easter time I went in a relaxation trip to beautiful Aracaju, one of the state capitals in Northeast Brazil. The flight has two connections/stops, so the problem of finding what to do is mostly solved by reading a good book or playing a good game. Guess which one was my choice this time around? The PSP was fully charged when I left, and the chance to finally try one of the PSN/PSP Minis was at hand. Minis are downloadable games that run both on the PS3 or on the PSP, and if it wasn't for the fact that these games are designed with the PSP in mind you could easily say that they are the equivalent to Microsoft's XBLIG titles. Cheaper, supposedly more simple games to be enjoyed with casual purposes. In this sense, The Flying Hamster is a perfect fit for shmup lovers who want a quick burst of shooting action. The design is cute, the colors are plentiful and the challenge is pure old-school, so anyone who ever had a chance to play a horizontal shmup will feel right at home. More experienced people will immediately recognize the influence of Parodius everywhere in the game, from the nonsensical story to the multitude of penguins in the egyptian stage. Watch the whole animated intro, get your powerful leaves spinning and expect humorous bits all around. Although a lot less complicated and not in the same difficulty level of Konami's stellar franchise, it's refreshing to know that The Flying Hamster isn't a walk in the park, requiring a reasonable amount of practice in order to be beaten. Newton's girlfriend was kidnapped by an evil bird, so he flies off to rescue her. Being a hamster, supposedly a small animal that can't carry any weapon while flying, Newton relies on a single spit-like shot and whatever lies ahead of him, including berries, bee hives, sunflowers, beer cans, bananas, torches, hot food, rose thorns and bird nests. He's also able to fire a more powerful charge shot for all weapons, including his default spit. Special weapons have limited ammo, but all accumulated ammo with whatever weapon you're using is preserved for the next one. Most weapon sources are also respawn after a brief while, so it's often possible to fill your weapon stock more than once using the same source. Getting crushed by a wall means instant GAME OVER regardless of lives left, but the good news is that every stage starts with three fresh lives. On top of that, random refills also provide some welcome recovery aid - you can't have more than three hearts at any given time though. The inherent gameplay simplicity gets put to the test by a stage design that presents a nice variety throughout. 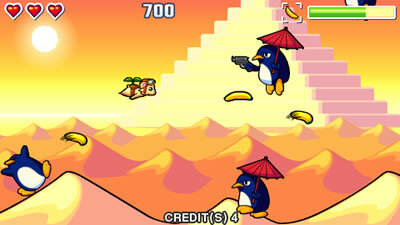 Goofy enemies abound and provide good laughs, with background graphics that include skies, forests, sand landscapes, pyramids, cluttered Japanese streets, stormy seas, underwater vaults and an appropriately named "hamster defense force" fortress in the last stage, complete with undescribable creatures, futuristic machinery and an alien last boss to boot. 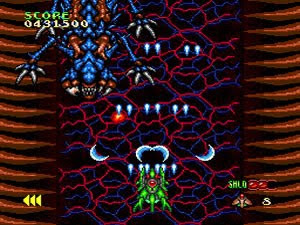 The scrolling speed picks ups every now and then, with a high speed scramble obviously inspired by Gradius II in the last level. Some weapons are more suitable than others in a few sections, with my favorites being beer and bananas. As straightforward as it is, The Flying Hamster still has a few secrets. The biggest one is the hidden level accessed by hitting the X spot in the lower part of the pyramid in the second stage. Regarding scoring, it's important to mention that killing bosses fast with powerful weapons results in less points than by hitting them with the default spit shot (try doing this with the mushroom mid-boss in the first stage and see what happens). The penguin boss in stage 2 can also be theoretically milked forever by destroying the concrete beams and the smaller penguins he summons. With the exception of the hidden stage, all levels can be played directly once you reach them, which is great for practicing. A few parts need solid memorization to be won, and these are probably the bulk of the challenge in the game. Once you beat it an extra Hard mode is unlocked, with a different color palette and much more enemies to deal with. Whatever difficulty you choose, the fun factor in The Flying Hamster is enhanced by an upbeat soundtrack that perfectly matches the relaxed feel of the game. The lighthearted epicness is impressive and makes it a worthwhile investment if you're into cheap downloadable content or just want a solid handheld shmup romp. Thankfully the in-game humor is quite lovely and not nearly as dark as in this heavily warped preliminary trailer. The 1CC high score below was achieved amidst several cups of coffee while waiting for departure in Brasilia's airport. Props go to my girlfriend for helping me figure out the laser from the feather attacks during the first boss fight! Master of Weapon is a no-brainer in any list of worst outings in the Mega Drive shmup library. That's a fact. Ask anyone, chances are pretty high someone with good knowledge of the genre will point it out as a flagship of horrid gameplay. My approach towards Master of Weapon has changed since the last time I played it a few years back, thanks to the fact that I recently beat the arcade-perfect PS2 version. This gave me a whole new mindset, which allowed me to deal with the most difficult parts of the Mega Drive port with less struggle - and also made me see how relatively easier it is when compared to the original game. Trying to understand the reasoning for a developer to release obscure and unsuccessful titles in the console market is useless, but it's important to know that the Mega Drive is not to blame for the crappiness herein. After all, everything in the game is faithfully inherited from the arcade original. The overall cheesiness, all the annoying sound effects, every bit of the painstakingly harsh (though softened) gameplay. Taito's arcade and console history is full of glory, but Master of Weapon doesn't do anything to get itself included in this legacy. It seems to do the opposite, but that doesn't mean it's worthless. Standing up to the challenge requires a lot of tolerance to pain and frustration, and in order to enjoy this game you have to dig deep, I mean deep into its guts. Damn, these aliens are ugly! 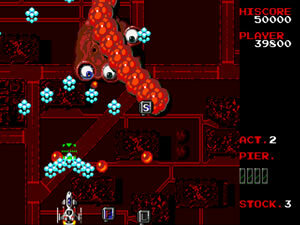 Pilot a lone spaceship against hordes of alien scum, and defeat a few crazy bosses along the way. Such a simple concept is also one of the strongest ideas about shmups in general, but the execution in Master of Weapon comes with some tricky details. First of all, the spaceship is so slow it almost hurts. The only way to make it maneuverable is by getting a few S icons brought by the green chips. The problem with this is that power-ups are completely random, and you might have to go through the first couple of acts/stages with absolutely no speed-ups. This also applies to the main weapon power-up, represented by the F icon (four Fs will maximize the spread of your main gun). Complementary to the main gun there's also a ground shot reminiscent of Xevious, with a third weapon acquired with the rest of the power-ups: P (pier, short for "piercing"), L (laser), W (wide), G (guide) and H (H-bomb). They are triggered by a different button and with the exception of the H-bomb they need to recharge for another blast. Lastly, the ship's exhaust can also damage enemies, and its reach is increased whenever you collect a speed-up icon. For those who haven't played the game, the weapon variety seems actually decent. It almost justifies the title. But then there's the way power-ups are handled. Adding to their annoying random nature, power-ups come down very slowly in circles that take a big part of the screen, and by forcing players to avoid the bad ones (P, L or S for excessive speed-ups) they incur in extra stuff you have to dodge. There is a workaround for this, and I will mention it shortly. Other than the annoyance with power-ups, Master of Weapon is remarkable for the complete absence of divisions between stages. These are labeled as "acts", they blend into each other without notice and not all of them have bosses. If you count the number of bosses, for instance, the game would have only five stages instead of the nominal nine acts. Scrolling alternates between fast and slow and kind of diverts the attention from the bland graphics, which are rather simplified but succeed in establishing the offbeat atmosphere. The soundtrack and sound effects, on the other hand, are extremely close to the arcade version, with the same grating, ear-bleeding noises. H-bomb: if you get one, don't use it, save it for the second form of the bosses; H-bomb is very powerful and overrides any special weapon you might have, but it can be used only once; it's perfectly possible to deal with stage enemies with just the main and ground weapons. Fly over bosses: you don't die when you fly over them (had I known it years ago the game wouldn't be as tough back then); this levels things in the boss fight from act 5 (second boss), the one that fires that green spread pattern that's very hard to dodge. Watching out for enemies coming from behind or from the sides is important to survive. Thankfully these don't come very often, so the memorizing aspect isn't that severe. The huge ship's hitbox rears its ugly head when you have to deal with boss attacks. Boss fights, in fact, are the most difficult parts of the game, and everything in between can be reduced to easy navigating with a bit of practice. Dying is only an option up until the second boss, because coming out of the third boss fight with only the pea shot makes it virtually impossible to go on. Extends are awarded with 30.000, 80.000 and then for every 100.000 points after that. I can honestly say that my appreciation for Master of Weapon improved this time around. I think it's not just a matter of being pure crap, as it's widely known, but instead the game demands a very specific style of play in order to be enjoyed (besides masochism, of course). Moreover, being able to see the ending of bad/hated tough games on one credit seems more fulfilling than doing it on your regular beloved shmup. Right? Uhh... Okay, no. 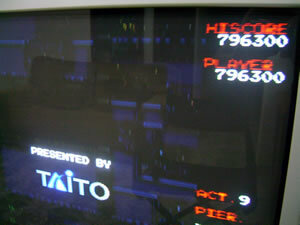 The 1CC high score below was achieved in a no-miss run, on NORMAL. The starting difficulty is EASY, so remember to go to the options and switch it accordingly before playing. First the good things about Firepower 2000. Graphics and music are decent. Very nice boss explosions. Short albeit cool introduction sequence. Ability to play with two different “ships”. A little variety in the weapons department. Given all these positive aspects, it wouldn’t be expected for someone to not like the game, but in the current state of my shmup affairs I found it just plain boring. And I shall disclose the reasons why in some of the paragraphs below. 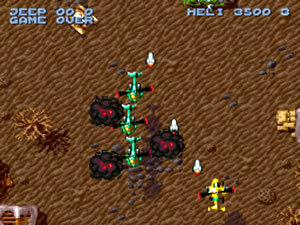 Spiritual sequel to the much better Silkworm and the computer based only SWIV, Firepower 2000 preserves the main idea of playing either with a helicopter or an armored jeep (or both in co-op) while keeping SWIV's top down vertical style. The game is also known as Super SWIV in Europe, having received a port for the Mega Drive under the title Mega SWIV (an European exclusive release by the way). In any existing incarnation, there’s no doubt that this game looks promising from the outside. In fact, I had already played the Mega Drive version before trying this one, and I honestly don’t recall being so utterly stricken by boredom. This could derive from two possible reasons: (1) I’m older and as a consequence I’m demanding more from my games, or (2) the SNES version just isn’t as fun as the Mega Drive port. Whatever it is, I had a hard time finding the motivation to play Firepower 2000 in the past weeks. I only did it in order to let my fingers rest from the strain of slashing devilish creatures in Sol Divide (material for a future post ahoy!). Upon starting you must choose the craft you want to pilot by pressing SELECT at the opening screen. The jeep is immune to flying enemies and is able to fire in any desired direction, but is hindered by ground obstacles. The helicopter flies over all the scenery but can be destroyed when crashing against airborne enemies. Opting for the jeep will make you play with a boat during part of the 3rd stage, and regardless of your option the 4th stage has a long section where you’ll be flying with a yellow jet. All of these vehicles/aircraft share the same weapons throughout the whole game though. These are activated and powered up by chips released when yellow boxes are destroyed, in five different types: bullets, flame, plasma (blue spread, Twin Cobra-style), laser and ionic (straight shots that split in two when an enemy is hit). They are selected with the shoulder buttons. Other items include limited special weapons, stars and bubbles. Special weapons are released by the same yellow boxes and are triggered by a separate button: X (straight missiles), S (scorching ring of fire) and H (homing missiles). It's possible to stock lots of them. Stars appear from certain destroyed enemies and are worth 1.000 points each upon stage completion. Once a bubble is sighted, shoot to release it and fly into it to get a temporary shield (12 seconds) or keep shooting if you want to detonate a screen-clearing bomb. Extends are awarded with 50.000, 100.000 and for every 100.000 points after that. Choosing to go with the jeep or the heli is mostly a matter of personal taste and gameplay style. I prefer the helicopter because I feel more comfortable with it. They both travel at the same speed, but with the heli I don't have to jump when I'm stuck (yes, the jeep is able to jump). Regardless of which one you choose you'll be at the mercy of the same things that irritate me, such as the wide horizontal stretch of the screen, which lures you into sweeping from side to side just to be fried by an off-screen missile or fast jet. The unpredictable pattern of early enemies is also annoying, especially in the first stage, but the design aspect I dislike the most is the sound you hear when your weapon hits something... It feels unfitting and slightly grating to my ears. I'm rarely prone to such antipathy towards a game, and in the case of Firepower 2000 my attitude seems out of place given its obvious aesthetical quality for 16-bit standards. I know this sounds like I'm being excessively picky, but I can't help myself. I will not dismiss the game for everyone out there though because I know some people enjoy it, and if you haven't tried it yet there's no reason why you shouldn't. I will comply that co-op play is more fun than your usual equivalent shmup, since each person gets to control a completely different machine. Unfortunately, co-op doesn't go hand in hand with 1CCing habits. 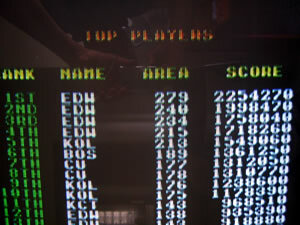 Completing the game will add a considerable bonus to the final score. This bonus is based on the number of lives you have in stock when you beat the last boss, but I wasn't able to figure out precisely how it works. On a minor scale, it's also possible to milk most of the bosses for extra points on popcorn enemies. Regarding the final boss, once you've destroyed the bunker and uncovered a black hole in the ground you have to wait for a special weapon to come in order to beat him (quite like the final shot on the Death Star from Star Wars Episode IV). 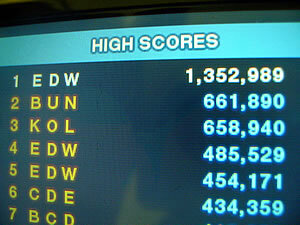 Since Firepower 2000 has no continues you're forced to go for the 1CC if you want to beat the game. It's not that hard to do it with the heli, but playing with the jeep is a completely different challenge in itself. 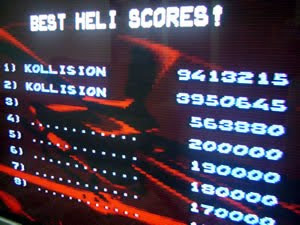 I used the helicopter, and I guess my high score was at least mildly decent in face of my overall lack of enthusiasm. One day someone asked me about shmups which were insect-themed, and the only ones I could think of back then were Insector X and Mushihimesama. I've just now discovered another one: Cyber Core. I would never have guessed insects are all over this game just going by its title or the generic HuCard box insert. As a name, "Cyber Core" is quite deceiving, since there isn't any really strong emphasis in cybernetic stuff or cores for that matter. What you get is an average PC Engine title that doesn't stand out, except for an unfair challenge spike everybody's bound to encounter in the eighth and last stage. Developed and delivered by a rather unknown company, Cyber Core's main influence is definitely Dragon Spirit, in that the normal shot is complemented by ground shots that are fired at a fixed distance from the ship's hitbox. It works exactly in the same way, and the similarities even extend to the story: in Cyber Core, the huge insect you control is actually a transformed human, the hero who must rid the planet from the alien bug infestation. 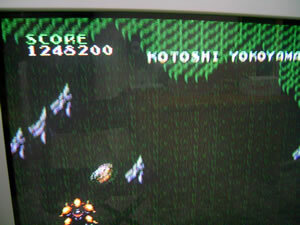 The intro to the first stage even includes his metamorphosis and the ship's departure into the battlefield. With a default insect-ship you die instantly by colliding with a bullet or an enemy, so don't hold yourself once the green bug that brings power-up icons passes by from one side to the other. Hit it non-stop so that it leaves behind four types of icons: the red, the blue, the yellow and the green. Getting one of those will immediately increase the ship's firepower and add a shield cell to the shield bar. Keep getting items of the same color in order to upgrade the current shot type and fill up the shield bar. By doing this the red weapon will turn into a spread pattern of large yellow circles, blue will result in a thinner but even wider spread, yellow will evolve into straight laser shots and green will add surrounding arches that are capable of stopping bullets. The downside of powering up is that the ship's hitbox increases enormously, making it difficult to dodge and preserve power. Getting hit consumes one shield cell, and when all shield cells are gone the ship starts losing its power-up levels until you die if hit when you're back to default conditions. What's neat about the power-up scheme is that each one of the four weapon types gives the ship completely different sprites. Some of the final forms clearly resemble a mite, a beetle and a grasshopper. What's not so neat is the fact that once you take a different power-up color you change the weapon but you also get back to just one power level above the default. It doesn't help that power-up items descend quite slowly once they're released, often causing the player to pick one up unintentionally during busy sections. Other items might appear randomly by killing regular enemies. There are screen wipe-outs, temporary invincibility (15 seconds), extra shield cells and 1UPs. Speed can be adjusted in three steps up and down by pressing the SELECT button. Pesticide bug-ship to the rescue! There isn't much to be said about the background graphics, aside from the fact that they look generic and unremarkable. Unfortunately, the same can be said about the music. The variety in enemy design is a bit better though, with all sorts and sizes of ground and flying bugs to be killed. Some stages have mid-bosses, but both mid-bosses and bosses are overall on the easy side. In fact, the game is pretty undemanding until you reach the last couple of stages. On the other hand, the developer clearly broke the difficulty knob in the very last stage, with all those tiny blue thingies that blaze across the screen at an incredible speed. It took me a long practice session until I was able to get through the whole stage with only one checkpoint. Oh yes, baby, die in the boss and play the whole stage again! Besides random 1UPs, the regular way to increase life stock in Cyber Core is by winning an extra life for every 100.000 points. Fortunately the game doesn't encourage checkpoint abuse when you try to play for score, since it gives you a substantial completion bonus based on the number of lives you have left. It's amazing how such a simple routine is capable of increasing the replay value of a potentially drab shmup. It takes Cyber Core out of the ordinary and serves as a lesson of basic yet effective design criteria to be adopted by all serious indie developers out there. All things considered, I can't really recommend Cyber Core except for shmup-nuts or for those who really love the PC Engine/Turbografx-16. Below is my high score, picture taken during the end credits shown after the bug hero managed to save the planet. Here it is, the spiritual sequel to Toaplan's seminal Tiger-Heli, or at least half of it. Half, you wonder? Yes, Twin Cobra is none other than the US/world version of the Japanese Kyūkyoku Tiger, which by all means is the "legitimate" spiritual sequel. Imagine the same relation that exists between Konami's Salamander and Life Force and you'll get the picture, even though the differences between Kyūkyoku Tiger and Twin Cobra are much more subtle, graphically speaking. The main draw for me, however, is the fact that Twin Cobra is the easier of the two, and therefore a much more approachable game for regular shmuppers. That doesn't mean it's a walk in the park though. Twin Cobra is 1/3 of the Toaplan Shooting Battle compilation released for the Japanese Playstation, which also has Tiger-Heli and Kyūkyoku Tiger. Publisher Banpresto provided a nice home package that makes this disc a very sought after item for shmup fans, especially those who appreciate the early Toaplan verticals. 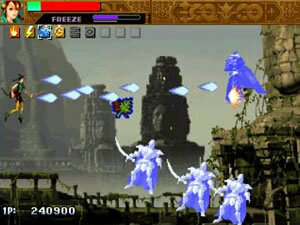 The game is entirely customizable (TATE available) and includes an additional option for an arranged soundtrack, complete with a new set of sound effects. I will gladly join the choir that preaches that Kyūkyoku Tiger/Twin Cobra is one of the cornerstones in the history of vertical shooters. A perfect evolution from Tiger-Heli, it established the mold to be used for years by Toaplan and a handful of other companies, with an undeniable influence that makes it a mandatory experience for everyone who wants to really get to know the genre. This is what I call a bomb, dawg! The PS1 port of Twin Cobra is just like the Arcade original, and the game stood the test of time gracefully. Take off from a base carrier and blast your way through ten stages of relentless enemy forces. Tanks, choppers and deadly turrets await you, all of them firing this very same yellow bullet of death. It's old school challenge for men, it's brute force against the hardest military odds, and it's definitely up there if you want to select a game to represent Toaplan's finest hour. 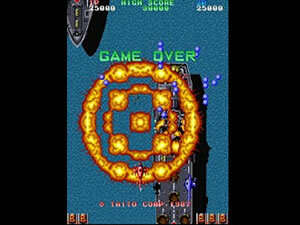 You could say that Twin Cobra is all about gameplay and challenge, but the soundtrack is definitely one of the most memorable early displays of great shmup music. Graphics are not fancy, but they're decent for a 1987 game and that's fine by me. On its way to victory, the hero chopper has four weapons at its disposal: vulcan (red), laser (green), spread (blue) and a four-way shot (yellow). Changing the weapon from the default vulcan to any of the others is made by taking the cycling colored circle released by the carrier choppers, which also bring the S power-up and the B item for extra bombs. It takes a good number of S icons to max out the weapon, while bombs have a delay between their deployment and the time they hit the ground, neutralizing bullets and damaging everything within its radius blast. And that's it for basic gameplay: fire with one button, bomb with the other. As a rudimentary but effective scoring mechanic, get stars released by ground targets in order to win an end-of-stage bonus (number of stars collected × 3.000 points). Don't be greedy when things get hectic, the most important thing is survival through memorizing the terrain, learning enemy patterns and dancing around bullets in order to survive. Taking the blue power-up and sticking to it during the whole game is the best strategy to use if you want to get the loop done. Later on it's just stupid to use vulcan or laser, there are so many enemies attacking you at once that blue - or yellow to a lesser extent - is the only way to go. Don't mind stocking more than seven bombs because that's the limit, so bomb away if one of those huge airplanes decides to get in your path, point blanking it during the bomb blast for a faster kill. Be careful with bosses though, they are armored beasts that spew bullets like crazy, so it's not really a good idea to try point blanking them. Fortunately you're allowed to stock more than the ten lives displayed on the top of the screen by getting score-based extends (first with 50.000 and then for every 150.000 points). Additionally, surviving long enough within a stage turns one of the later stars into a 1UP (this doesn't happen if your life stock is at ten though). "Wow, more than 10 lives? ", you ask. Believe me, you'll need them! Aside from the lack of checkpoints, the possibility to play in co-op with a friend is the most distinctive departure from Kyūkyoku Tiger, the original game. For a list of all differences between both titles you can go to the bottom of this nice page. Even though the Playstation version of Twin Cobra is the reference for home play due to its arcade-perfect nature, most of the many other ports are also very solid games in their own right, and deserve all the love we shmuppers can give. I was able to loop this version until stage 2-2, playing on NORMAL with game speed set to "Arcade". The synth-heavy arranged soundtrack is a nice extra, but I still prefer the original tunes and sound effects, and that's what I listened to during all my runs.